3 types of 3D printers were developed: the Cartesian, the Delta, and the Scara, differing in mechanical construction and kinematics. The Fourth Industrial Revolution (IR 4.0) has brought forth significant changes in the development of world technology. One such development is that of the three-dimensional printing machine, which is more popularly known as the 3D printer. Aside from advanced robotics and augmented reality and virtual reality (AR/VR), 3D printer is considered as one of the keys to the modern times, particularly in the physical layer aspect. 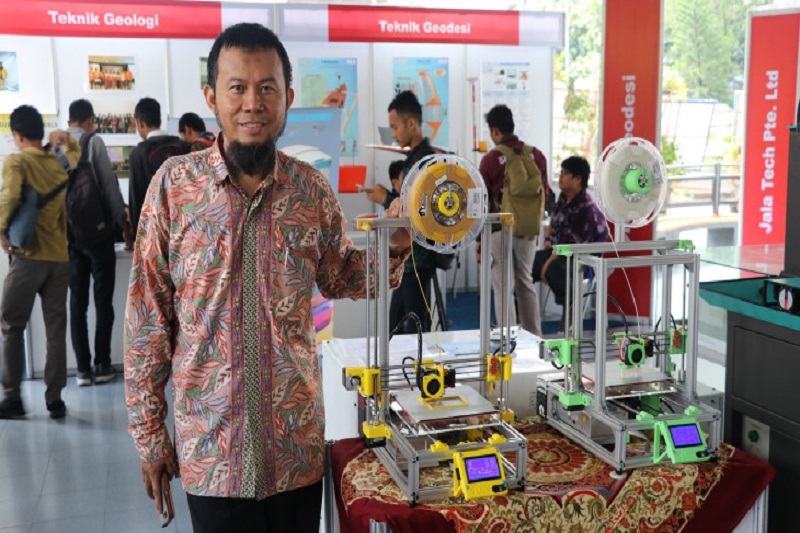 According to a recent press release, the Faculty of Engineering at the Gadjah Mada University has been researching on 3D printers since 2014. The research and development was led by one of the University’s lecturers, Dr. Eng. Herianto, ST, M.Eng. He collaborated with students as well as alumni to develop and be the pioneer in 3D printers. The Lecturer initially started his research by importing 3D printer products from overseas. He, together with his team, would dismantle each item they bought in order to examine and study each of the components. With that process, the team managed to make an initial prototype of their 3D printer within one year. Three types of 3D printers were developed by the team. These are the Cartesian, the Delta and the Scara. The types differ in mechanical construction and kinematics. The Cartesian 3D printer was explained as being named after the dimensional coordinate system, which is the X, Y, and Z-axis. The dimensional coordinate system is used to determine where and how to move in three directions. The Delta 3D printer was designed for speed but has the distinction of a print bed that never moves, which may come in handy for certain print jobs. Scara stands for Selective Compliance Assembly Robotic Arm. It is a very precise system with a tiny footprint. A Scara 3D printer looks and moves much like an industrial robot on a car assembly line might. The team of researchers has currently reached the production stage and is now pursuing the goal of producing 1000 engines per year. The 3D printer that they have developed has now been used by several universities, colleges, polytechnics, vocational schools, and several MSMEs. With the 3D printer that they have developed, the team wants to prove that this was made possible by the Indonesian people and will hopefully bring recognition to the University. The product can eventually be used for the national interests and progress of the country. Moreover, the Lecturer now aims for his 3D printer to be used in homes. To achieve this, he introduced his project called HALTech, which stands for Home as Laboratory Technology. With this project, he wants to bring the IR 4.0 products he developed into homes because the concept of his project is to make a laboratory in every home. OpenGov Asia earlier reported on the Advanced Manufacturing Centre for 3D printing research that the Philippines will unveil. The Centre will feature two state-of-the-art research facilities that are seen to spur interest in Additive Manufacturing Research.